Giant wind turbine blades – each one as big as the trailer on an articulated lorry – are made on the Isle of Wight, before being shipped over to Southampton, and eventually on to their final locations. The name of boat that brings them over…? it’s called the Bladerunner. 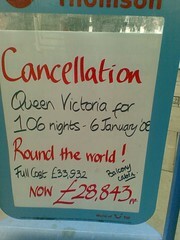 Wandering through town today I spotted this unlikely looking holiday offer and thought I had to snap it up immediately. Unfortunately P doesn’t have 106 holiday days left this year 😦 that and we don’t have £30,000 each stashed away. Front page of the Evening Post! Well, I’m on the front page of our local newspaper today with a comment on a story I sort of set going. When my Development Control committee papers arrived a few days ago, I was surprised to see Old Market Square listed as one of the planning applications, so I thumbed through to see what it was. Turned out it was a planning application for a temporary ice-rink – one which they’ve already started building. In the normal run of things, you should check whether you need planning permission long before you start building anything. In the case of the temporary ice-rink, it’s due to open the day the committee decides whether it’s allowed or not. I thought this was a sign the Council isn’t quite joined up enough in its planning, and joked about it with colleagues, who suggested we phone up the very good Politics Correspondent on the local paper, Charlie Walker. Initially, I was pitching it as a jokey diary piece, so I was rather surprised to find it on the front page today. I don’t want to come over as a complete kill joy, and when the application comes to committee I will, as always, consider carefully the evidence in front of me before I make my decision. I’m pretty sure I’ll vote for it, but I am legally obliged to go into the committee with an open mind. On the one hand, Nottingham already has an ice-rink, so I’m not entirely convinced we need another. On the other, I remember an outdoor ice-rink outside the Hotel de Ville in Paris when I was there one year, and it looked great. And Nottingham’s outdoor ice-rink has already proven popular, with some early sessions already fully booked. Either way, you can see the ice rink being built, and in the fullness of time, you’ll be able to see skaters, on the Old Market Square Webcam. And that’s another thing I can claim credit for – I asked for the webcam to be installed in the Council House so that we could share the view of the construction of New Old Market Square a year or two ago, and the webcam is still there now. My brother is growing a “mo” – a moustache in Australian slang – in November. There’s a site called www.movember.org that explains more, but basically you start with a cleanshaven face at the start of November, and grow a mo by the end of it. You get sponsored to do it, with the cash going to men’s health charities. I vaguely thought about joining in, but I think it might be counted as cheating to shave off part of a beard and end up with a mo. Youtube hustings – where are the women? As you’ll know if you’ve been near a telly or a radio recently, the Lib Dems are engaged in a leadership election right now. In order to let the 70,000 members who get to make the decision on who the next leader will be, we have hustings where both candidates set out their stalls, and people ask questions to check which candidate thinks the right things. Those hustings are taking place up and down the country. There was one in Derby recently that I attended with a hundred other local Lib Dems – but there are still many more around here and in many other places up and down the country that won’t have the opportunity to quiz the hopefuls in person. So, the party has been innovating, and finding new ways for people to quiz the contenders from the comfort of their computers. There’s a plain text forum, but more excitingly, there’s a Youtube hustings going on. But no women have asked a question. Which begs a question all by itself! PS – Spiderman vs Darth Vader – that is tough! Darth Vader has the Force, his light sabre… What does Spiderman have? !